Retinoblastoma is the most common intraocular tumor of childhood. Retinoblastoma treatment requires the care of a multidisciplinary team composed of the pediatric hematologist/oncologist, ophthalmologist, clinical genetics, radiation oncology and many other sub-specialists in concert with a full spectrum of care services available at Nicklaus Children's Hospital. The Nicklaus Children's Hospital neuroradiology team provides the high-quality imaging and MRI studies essential to the treatment of retinoblastomas. Chemotherapy protocols are available to help preserve the eye and specific care with laser treatment is also offered. The latest treatment modalities including Intra vitreous and Intra-arterial chemotherapy are routinely used. When needed, measurements and fittings for an ocular prosthesis can be coordinated at the hospital. One symptom of retinoblastoma in children is white spots on one or both pupils. Instead of typical "red eye" in pictures, there may be a white glow that appears in photographs. 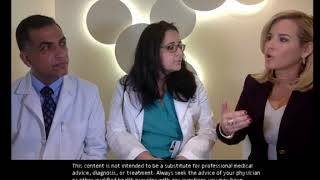 Dr. Toba N. Niazi, Neurosurgeon, and Dr. Ziad A. Khatib, Hematologist and Oncologist, discuss the second leading cause of cancer in children, brain tumors.